politicians. Did those happen after they were elected? Or did having it in advance make them eligible for funding? In this story they throw out a incredible figure of 89% of our senators and congressmen have dual citizenship. Its much less, so just pre-warning you. But still much more than even the percentage of Jews in American society. 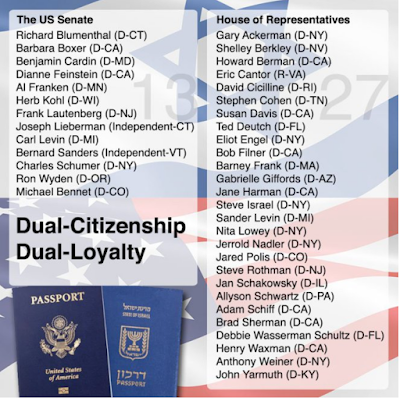 I quick guess by inspection, is around 15% have dual American Jewish citizenship. For decades USA plundered third world countries via Economic hitman approach, Japan too. Then "they" turned their eye on the motherload of wealth, the USA, and 2 purposes….plunder the wealth and take it out of country, and weaken USA so it can be more readily controlled. Your endless attacks on capitalism are depressing, and they right into the hands of the socialists that are now campaigning openly. Socialism has never worked. 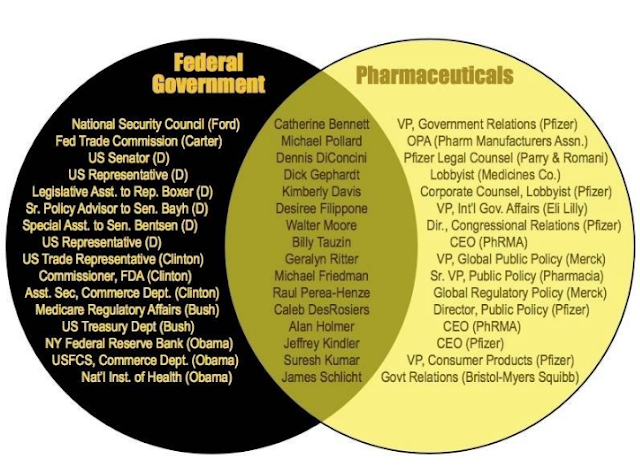 But NWO is fine with anything that allows control and wealth transfer. That is what we are fighting, now. The declassification of large amounts of government documents can and will convict many in power of sedition, being a traitor. Military Tribunals will effectively process these cases without having to use the 1000's of liberal judges that Soros has installed into our country. Graham asked Kavanaugh specifically about Military Tribunals. The left is scare shitless….worried about jail or death, and willing to fabricate stories on how a prep school high school boy was somehow the lynch-pin for numerous organized gang rapes disguised as parties. 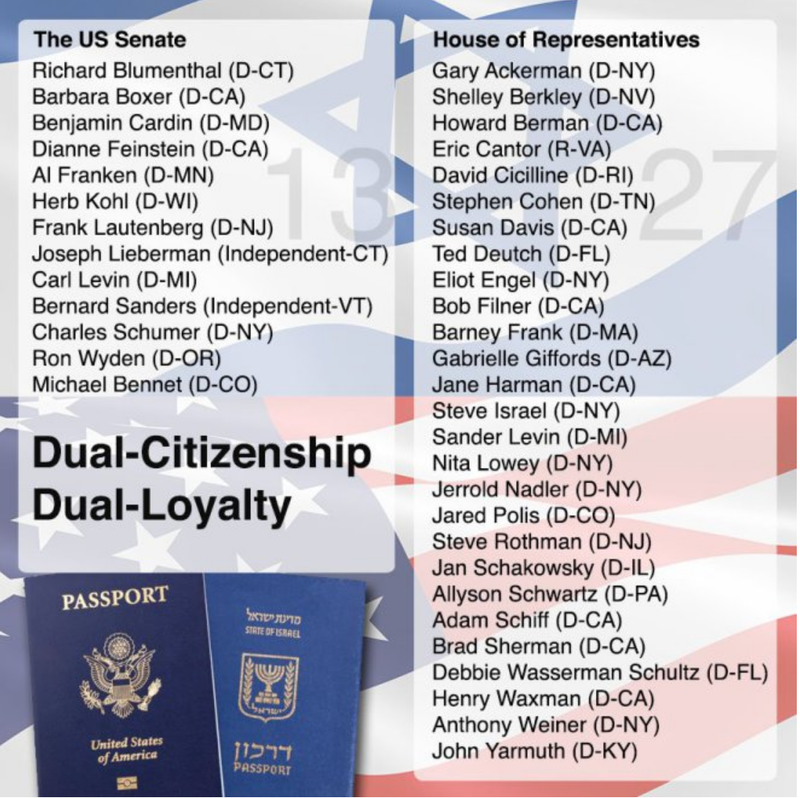 89% of our Senators and Congress hold dual citizenship citizenship with Israel we are in Syria because of Israel ask yourself who is the real traitors to the country sacrificing American soldiers for the benefit of foreign country. "Until the Supreme Court decided otherwise in the 1967 case of Afroyim v. Rusk, a U.S. citizen who voted in a political election in a foreign state would forfeit his or her U.S. citizenship. From that point on, dual citizens have maintained their right to vote and hold public office without penalty. Anyone can become a dual citizen, even members of Congress, high court judges and top officials of the executive branch. There’s no law or regulation against it. Nor are they required to disclose such dual citizenship." No wounder the US is so F***ed! OK, who was it on SC at the time? Solution - Trigger Time! To serve in Congress, President and just any Judge. 3. We're running out of rope, cupcake time is over. Watchout, in Detroit, a Muslim bakery won't bake that cupcake. TY for the background though...great information. Aye, Thank you Stock, allow me to explain: Christianity, meaning a spirit that shares all things collaborated from love, respect and honor, we earn it. Now this will even trigger the science community. A new science, GOD and Science, 'The Balance' we're in this together which will bring more value. The Holy Grail for humanity will be understanding all matter. Like Dark Matter may be the substance that supports solar systems and Galaxies, like a Mother's womb creates life. The Native American Spirit referred to life all around us as The Grandfather, a respect the land offers, a banquet to share and you're grateful... This is a relationship with the Mother, Earth, (The Ship) her frequency and vibration of all life and our understanding of it.